Image caption Tuesday's action is the second one-day strike in an increasingly bitter dispute over pay. It follows a walkout in October. Staff at UK universities are taking part in a second one-day national strike after employers refused to increase their pay offer. Unions representing academics and support staff describe the dispute as "increasingly bitter" and expect thousands to join picket lines. They say the 1% on the table is "miserly" and represents a 13% pay cut in real terms since October 2008. The employers say the offer is "sustainable, fair and final". 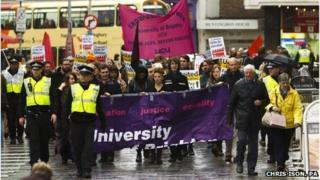 The walkout follows a strike by members of Unison, the University and College Union (UCU) and Unite on 31 October. They are joined for the first time by the EIS union in Scotland. The unions say the action will see lectures and tutorials halted, libraries closed and support services disrupted. Unison says some 4,000 of its members who work as support staff in libraries, administration, catering, cleaning and security are paid below the living wage of £7.65 an hour or £8.80 in London. Unison general secretary Dave Prentis said: "The employers' imposed payment of 1% does not address the increasing cost of living for staff who face rising energy costs and increasing food bills. "A fair day's work deserves a fair day's pay, and higher education workers deserve a better standard of living in return for their hard work and the contribution they make to the success of UK universities." Michael MacNeil, UCU head of bargaining, said staff were striking to say "enough is enough". He said the 1% pay offer "was the straw that broke the camel's back". "Staff love their jobs, but their goodwill cannot continue to be taken for granted. "Nobody wants to take strike action and lose a day's pay, but we feel we have been left with no alternative." A spokesman for the Universities and Colleges Employers Association (UCEA) said they expect "very limited disruption". "The overwhelming majority of staff realise that the unions' continuing demands for higher pay increases are neither affordable nor sustainable and they have no wish to cause any disruption to their institutions, and especially their students," he added. UCEA says incremental rises for staff mean the annual pay bill will actually increase by 3% in most institutions. The employers add that they are willing to discuss the other important aspects of the claim, including the gender pay gap, hourly-pay and casual work. National Union of Students president Toni Pearce urged a speedy resolution to the dispute. "For that to happen we need to see the employers getting round the table with the unions and negotiating a fair and sustainable settlement. "Our own research shows that more than half of UK universities pay at least some of their staff less than the living wage. "It is those on lower wages such as porters, cleaners and kitchen staff who have already lost out in the pay squeeze and now stand to lose out again." The National Campaign Against Fees and Cuts has called on students to show "solidarity with staff and the fair pay strikes" by joining pickets and boycotting classes. In a separate dispute, UCU members at further education colleges will also strike on Tuesday over a 0.7% pay offer. UCU says further education lecturers' pay has fallen by 15% in real terms since 2009. Emma Mason, director of employment policy and services at the Association of Colleges, said the offer had been accepted by all other unions in the sector and "reflects the very real financial constraints our member colleges are facing". "Since 2010 government funding to colleges has reduced by 25%. "UCU's industrial action risks damaging the education and training of students, undermines the reputation of colleges both locally and nationally and places an undue burden on non-teaching staff and non-union members to take measures to minimise disruption to the student experience."